Here's the scenario. You purchase a lovely patio set with vibrant, comfortable cushions. You love it. Spend your whole summer on it. But by the next year the sun has faded the fabric so badly that you are embarrassed to use them again. So you go to buy new cushions and either can't find them or stand there in utter disbelief of how a replacement set of cushions costs more than the whole patio set cost last year. Sound familiar? Ugh. Don't get caught in that continuum. You can buy a UV fabric spray that protects from fading. 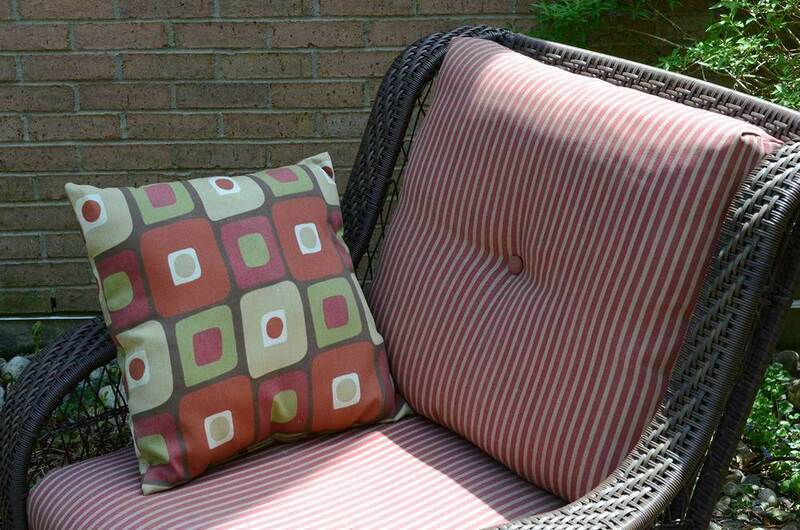 You can buy outdoor fabric and recover the cushions in any funky pattern you like for a fraction of the cost of replacement cushions. Plus the quality of the fabric you buy typically is higher than what came on the cushions originally. I'm only going to cover thing #1 in this post because, frankly, the cushions I recovered years ago still look pretty good! But when they need a new coat of fabric, I'm guessing next spring, you'll be the first I show. So, thing #1, fabric spray. I buy ForceField®UV SunBlockTM Sun/UV Protectorant for Fabric in a fabric store; it is usually placed near the outdoor fabric (duh). I've not found it in a department store, but that doesn't mean they don't sell it. Of course, you can buy it on Amazon. One bottle took care of my whole set (two chairs and a loveseat). Application is simple. It comes in a spray bottle and you just coat every cushion with a fine mist (don't forget the pillows and the umbrella!) and let dry completely. I do this in the early spring and if you leave the cushions out all year, probably again in the fall. It is also great for flags and inside furniture and rugs near a sunny window.